Photograph by Eli Pousson, 2015 February 12. Established in December 1849, Western Cemetery is a historic cemetery administered by Beechfield United Methodist Church. In late May 2014, a retaining wall on the southern end of the Western Cemetery collapsed following a severe thunder storm. WJZ and WBAL both reported on the collapse at the time. The collapse dropped a flood of soil and debris down hill and blocked the Gwynns Falls Trail. Continued erosion at the site is dumping sediment into the Gwynns Falls with every storm. The Parks & People Foundation and the Gwynns Falls Trail Council secured partial funding from the Maryland Department of Natural Resource to stabilize the wall and eliminate the sediment pollution. Unfortunately, Baltimore City Department of Recreation and Parks and the Beechfield United Methodist Church have been unable to determine clear responsibility for the property boundaries and the required repairs to the retaining wall. In February 2015, Baltimore Heritage visited the site with Parks & People staff to document the ongoing issue following the 2014 collapse. Baltimore Heritage prepared a report on the history of the cemetery and provided Park & People with resources related to cemetery conservation and funding. We encourage Baltimore City and Beechfield United Methodist Church to continue their efforts to resolve the disputed property boundaries and stabilize the damaged wall. More broadly, the administrators of Western Cemetery should evaluate the cemetery’s existing conditions and their management policies to ensure the careful stewardship of this important historic landscape moving forward. Three years later, in December 1849, the Maryland Assembly passed “An Act to Establish the Western Cemetery” allowing the Trustees of the Fayette Street Methodist Episcopal Church to open a “public” or nondenominational 55-acre cemetery west of the city in Baltimore County. When Edmondson Avenue was improved as the major east-west route across the Gwynns Falls, the main entrance for the cemetery shifted from West Baltimore Street to its current location at 3001 Edmondson Avenue. Early burials at the cemetery included both city and county residents from a range of backgrounds. In 1858, the Sun reported on the burial of William Fairbank, a Baltimore County resident who worked as a conductor on the Baltimore & Ohio Railroad between 1830 and 1850 and as the keeper of the bridge on the Baltimore and Washington Turnpike. In the fall of 1861, a number of Union soldiers stationed in Baltimore, likely including soldiers recovering from injuries taken at the Battle of Bull Run (or First Manassas) in July 1861, died from typhoid fever and were interred at the Western Cemetery. 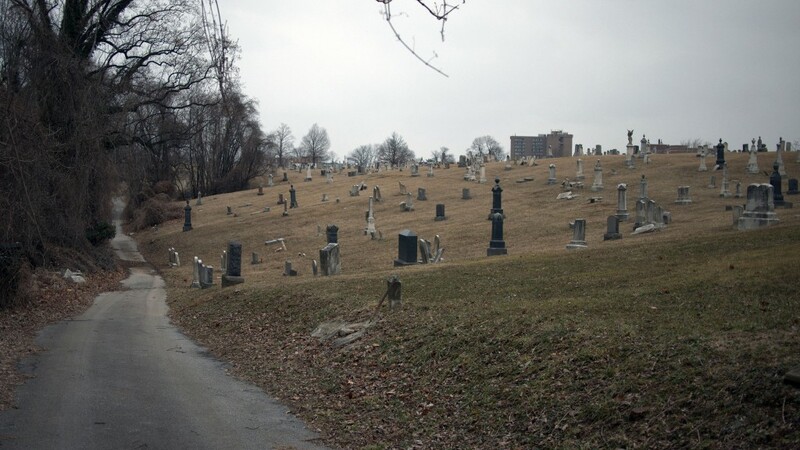 In 1915, Baltimore City acquired a portion of the cemetery property for the construction of Ellicott Driveway. This required the closure of the “the railroad crossing at the Cemetery lane entrance to Western Cemetery” and an agreement between Baltimore City, the Pennsylvania Railroad Company, and the officers of the cemetery company. After World War II, the city began planning for the East-West Expressway and, by the 1960s, had identified a route that cut through Western Cemetery. By 1969, family members of those interred at the cemetery had joined advocates for the Gwynns Falls/Leakin Park, and residents of east and west Baltimore in fighting against the proposed highway. Fortunately, Mayor Thomas D’Alesandro responded and encouraged state highway designers to consider a new route for the Rosemont section of the East-West Expressway to bypass Western Cemetery. Between 1976 and 1977, a number of graves were transferred from the cemetery of St John’s Evangelical Lutheran Church to the St. John’s Ground section of the park near the original West Baltimore Street entrance.